Donald Averill & Don Webb before opening in 2008. In just three short years, Naked City Brewery & Taphouse has become one of the cornerstones of the craft beer scene in Seattle. Their business model of focusing on being a top flight taphouse pouring beer from breweries from all over the place to compliment their lineup of house-crafted beers is a little bit of genius. This Saturday, they’ll celebrate 3 years of business with an all day party featuring special beer releases, raffles, giveaways, live music, and even an oyster bar. Congrats to everyone at Naked City on 3 great years! Naked City is proud to celebrate three years at our Greenwood location with an all day party on Saturday, October 22! Join us for all day happy hour ($1 off Naked City beers), raffles & giveaways, live music from Simon & Ben, an oyster bar, & 15 fantastic Naked City beers on draft and cask including rarities and one-offs available exclusively at Naked City for our anniversary. Come try Dark Passage, a stunning merlot barrel aged imperial sour, along with casks of Big Lebrewski & I & I Imperial IPA. Limited edition anniversary shirts will also be available! 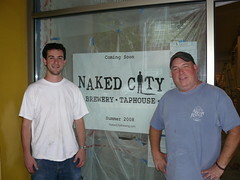 Congrats to Naked City! Have a great celebration today.